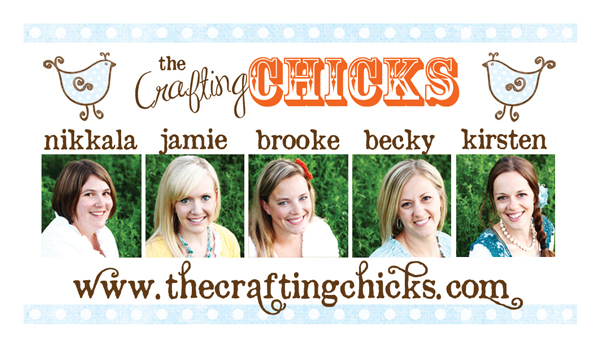 Hi, my name is Brooke and I'm one of The Crafting Chicks! I am thrilled to be guesting here at Every Creative Endeavor along with some other super creative bloggers for the Fall Fever Event. I can't wait to see what everyone shares the rest of this month! Over at The Crafting Chicks we share a wide variety of projects, including trash-to-treasure makeovers, recipes, home decor, gift ideas, tips and tutorials, free printables, kids crafts and all sorts of things to inspire you have a creative life. All 5 of us Chicks are moms and like to use creativity as a form of therapy in the midst of our hectic lives raising children! ;) We'd love to have you join us! Alrighty, now onto my post! I love all things "mini." Especially when it has to do with food. 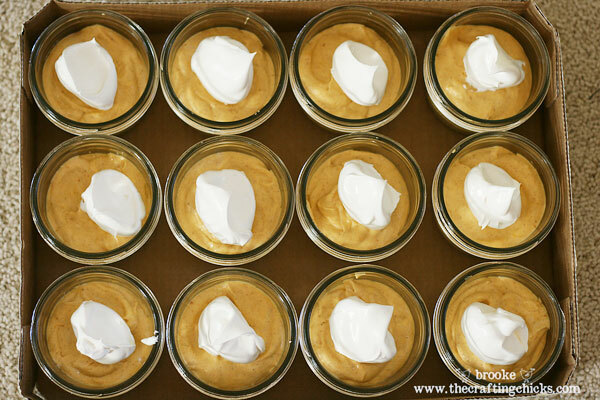 :) So when I saw the idea for little potted pumpkin pies on the beautiful blog inchmark, I immediately wanted to make some of my own. 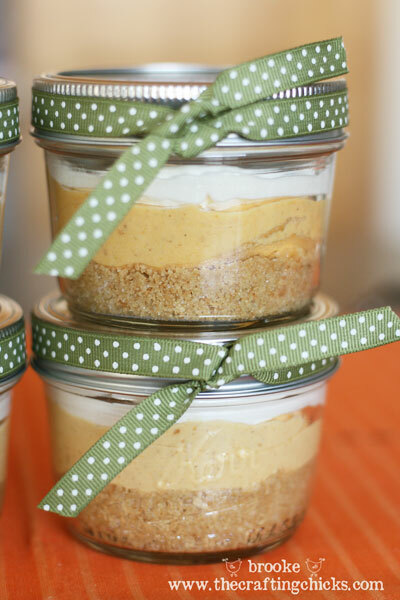 It's such a fun idea for a delicious fall treat--making little individual mini jars of pie just adds that extra special touch. It's very easy to put it all together. 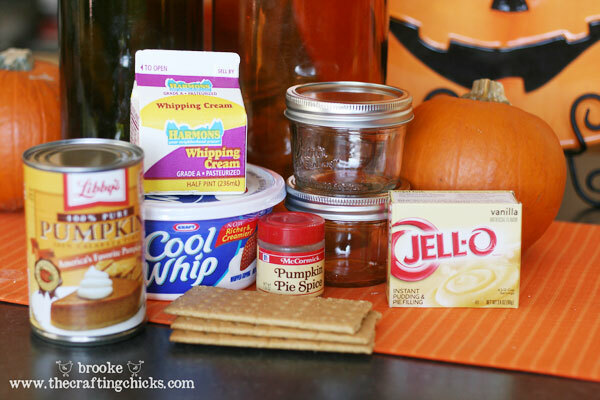 Now, I don't love regular pumpkin pie, but I DO love me some pumpkin cream pie and make it every year for fall and Thanksgiving. 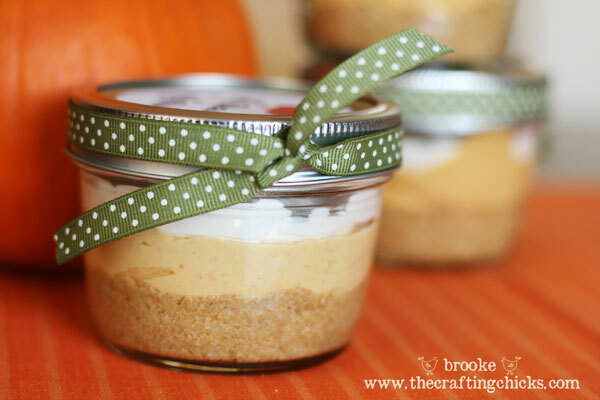 So that's what I put into the little "pots" instead of regular pumpkin pie. 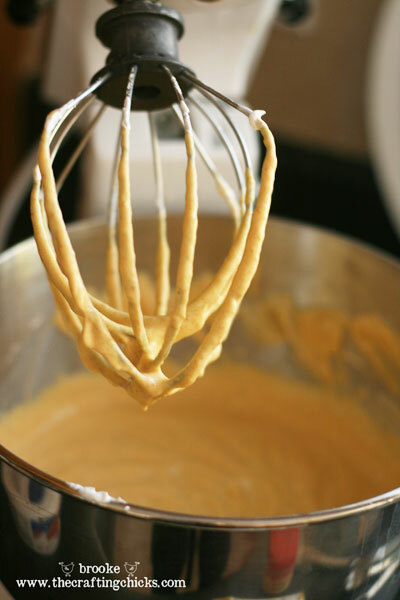 It is a simple recipe with delicious results! 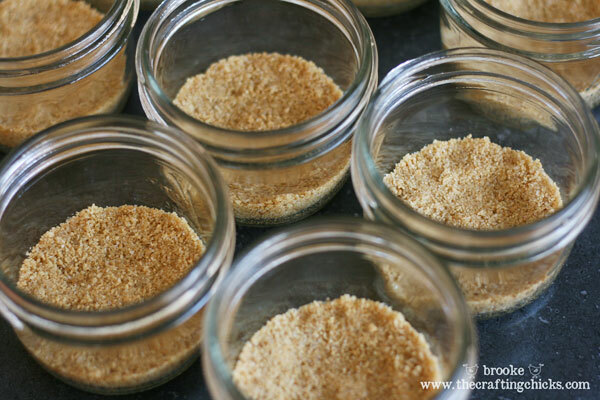 To make these, you will need the ingredients for pumpkin cream pie and graham cracker crust (in more detail below), as well as 12 small mason jars (I used half-pint wide mouth jars found at the grocery store, 1 dozen for about $7.99). 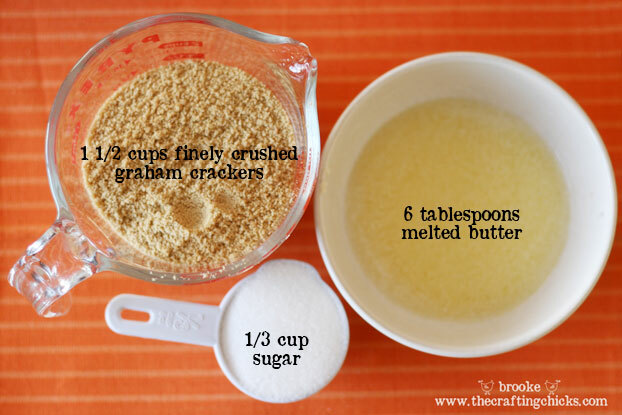 Mix these together well, then press into the small mason jars with your fingers, and chill in the fridge. I did not cook this crust. 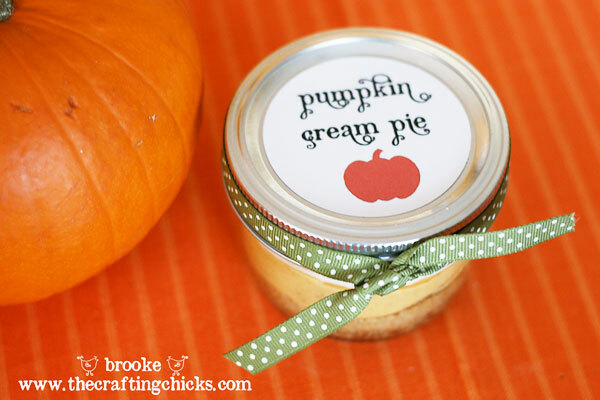 For the finishing touch I created some simple "pumpkin cream pie" labels in photoshop (my favorite font lately is LD Adornment), printed them out and used a 2.5 inch circle punch to cut them out. 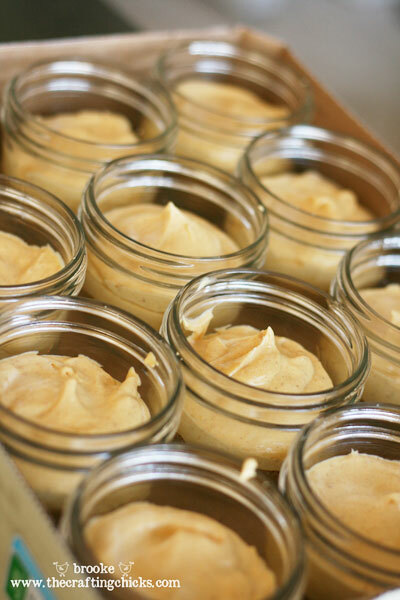 I used double sided sticky tape to stick the labels onto the flat lid on the jars. I also added a ribbon around the outside of the lid. 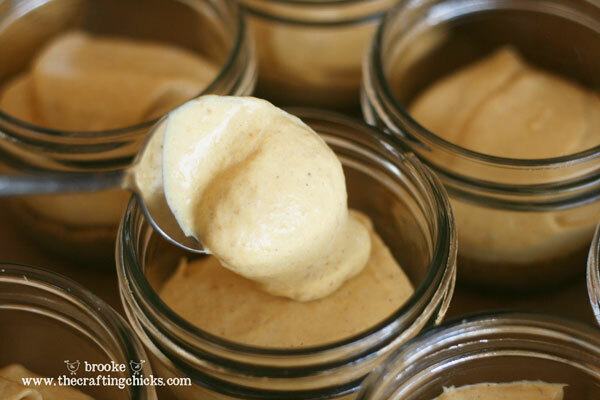 I think they look totally adorable and I love the layers of yumminess you can see with the clear glass jars. :) It's fun to grab a spoon and get all three layers in one bite. 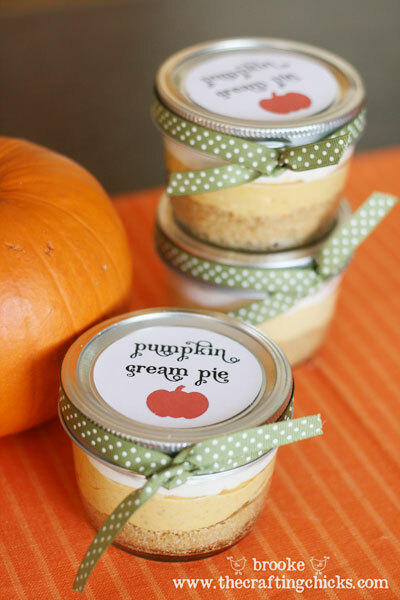 This would be a cute treat to take to neighbors and friends, or you could even use them as place settings at a holiday dinner--create name tags to put on the tops of the lids instead of the pie labels. A fun and different way to serve up dessert this fall. Thank you so much Brooke! Those look so yummy and just like you, I am a fool for all things mini! I cannot wait to try them out! Tomorrow is giveaway day so make sure you come back and enter to win some great prizes! These are so stinkin cute! I'm definitely making some of these. I followed you over from your blog....love this place too! Thanks for sharing! These are SO cute! I despise (gasp!) pumpkin but I would totally make these as chocolate cream pies! :) Love your blog!